Yesterday I saw an interesting topic on TGP about the Quadrature machine on Strymon Mobius. 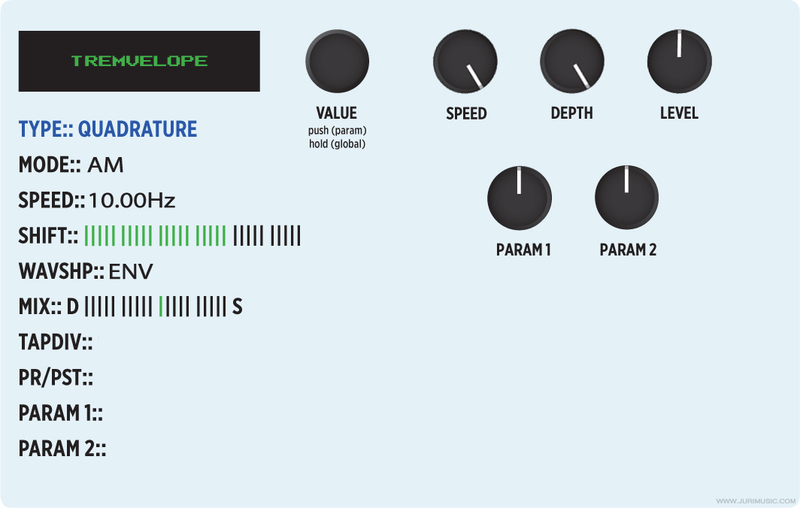 V had discovered that you can get some pretty useful sounds by using the envelope waveshape with low shift settings. I have used the Quadrature in AM mode for a cool envelope tremolo sound before, but V pointed out that you can get some nice attack-dependent pitch shifting effects with FM, F+ and F- modes. So, I did some quick experimenting and it really works very well! The point is that the envelope waveshape makes the effect react to your picking dynamics: pitch shifting kicks in only when you pick harder etc. "FM Pitchpirate" is a vibrato preset that sounds especially good with harmonics. You can lower the shift setting to make it more subtle. Experimenting with different pickup combinations is also recommended since the envelope seems to be more sensitive to lower frequencies. Need some chorus sounds? No problem, just lower the mix a bit. "Tremvelope" is the exact setting I used on this video. It's named "AM Ring" on the video, but like the new name implies it's an envelope tremolo sound.